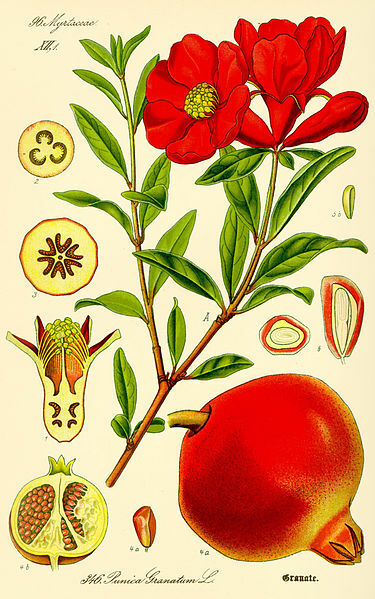 Pomegranate illustration from Dr. Otto Wilhelm Thomé's Flora von Deutschland, Österreich und der Schweiz, 1885. Image from http://www.biolib.de/. 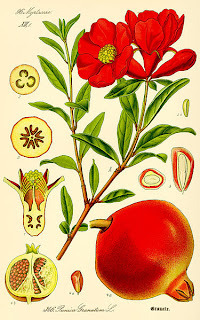 The pomegranate (Punica granatum) is a fruit-bearing shrub, originating from the Middle East and Mediterranean Basin. Throughout history, the pomegranate tree has been used for a variety of purposes. It's bark has been used to cure leather, it's rind and flowers have been used as textile dye, and it's fruit has been prized for its delicious taste and medicinal properties. Images of the pomegranate have permeated visual culture since ancient times. In Ancient Greek mythology, for example, the pomegranate was the food eaten by the dead in the underworld. In the world of fashion history, the pomegranate has had an extraordinary impact on textiles. Silk from the 15th or 16th century. Museo Civico d'Arte Antica. 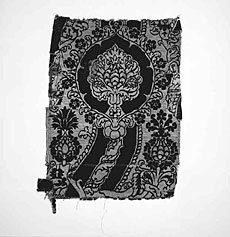 This textile shows the so-called "pomegranate motif". This stylized design of a central floral image surrounded by wavy stems has its origins in the Ottoman Empire. Under the reign of Süleyman I, also known as Süleyman the Magnificent (r. 1520-66), the arts flourished, and the textile design of a flowering plant such as carnations, blooming palmettes or pomegranates surrounded by a lattice pattern became extremely popular. These textiles made their way across trade routs to Western Europe where they were prized for their elegant patterns and luxurious materials. These motifs were also adopted by Western European artisans, and dominate textile design of the Renaissance. Length of brocaded velvet, late 15th century, Italian (Venice). The Metropolitan Museum of Art. Today, it's hard to understand the extreme value textiles held in the centuries before mass mechanized production. Of course in the pre-industrial period, everything was made by hand. Creating textiles with complex designs such as the pomegranate motif took an enormous amount time and incredibly skilled artisans. Furthermore, the rich colors and expensive materials present in many surviving textiles with the pomegranate motif added additional cost. Red and black dyes were among the most expensive dyes on the market. And many textiles incorporated metal-wrapped threads. To create metal-wrapped threads, thin strips of actual gold or silver would be wrapped around a strand of thread (usually silk). When this thread was woven into a fabric, the resulting textile would literally be made of silver or gold. The above textile is a silk velvet with metal-wrapped threads. The rich red color, complex pattern, and use of metal threads would have made this piece extraordinarily expensive. 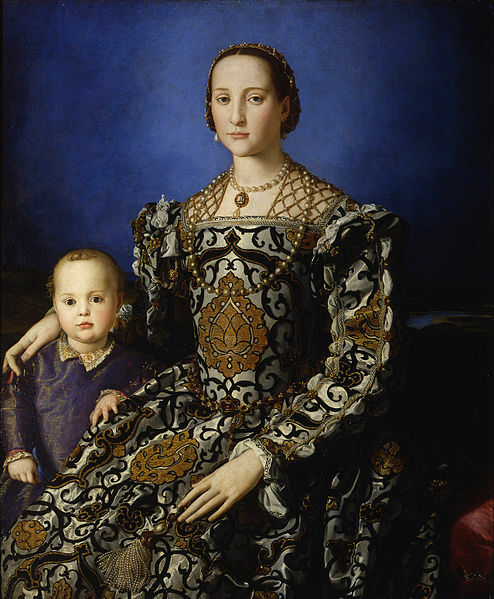 Portrait of Eleanor of Toledo and her son Giovanni, by Bronzino, c. 1514. The Uffizi. Textiles were among the most expensive items a person could buy. Textiles with the pomegranate motif were used for clothing (as can be seen in the portraits above and below), furnishing, and ecclesiastical garments. When looking at the art of the period, textiles with the pomegranate motif show up in a large number of portraits and religious art. Their use was not just because the textiles provide a visually interesting pattern. As this post shows, the use of these textiles was also a potent expression of wealth and power. 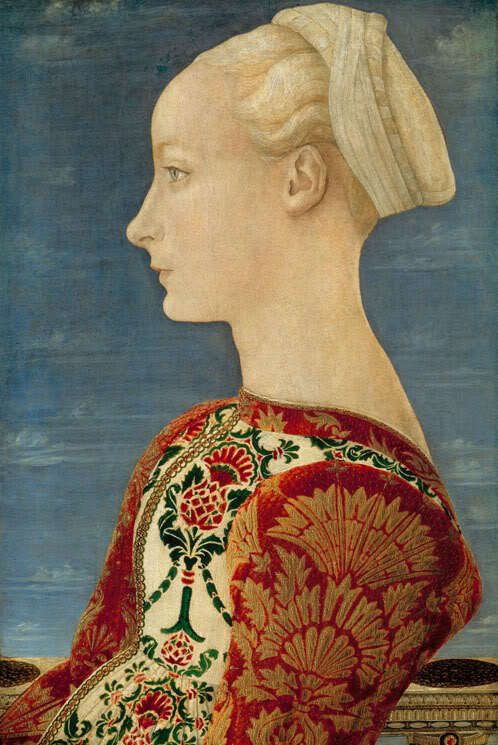 Portrait of a Girl, by Antonio del Pollaiuolo, c. 1460-65. Gemäldegalerie, Staatliche Museen zu Berlin. Furthermore, the prevalence of the pomegranate motif in visual culture attests to the connections between cultures all over the globe. Too often people tend to think of the Middle Ages and the Renaissance as a time when cultures were isolated, and global interactions were not present. But the pomegranate motif is just one piece of evidence that proves that a global exchange of ideas and cultures was alive and well.